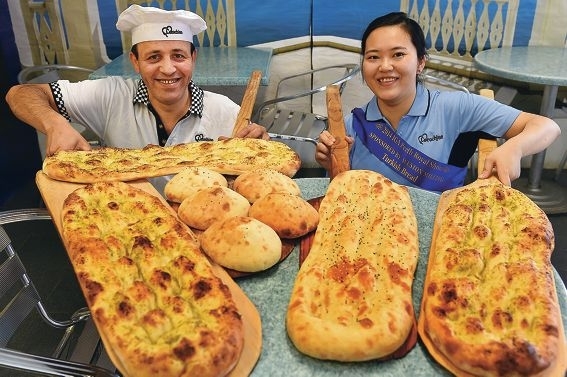 Mr Alkaabi said he took great pride in producing homemade breads, pastries and kebabs, introducing Australians to an authentic alternative to the average kebab shop. ‘The food is great here but I work hard to show people how to do it right, I don’t like the pre-mixed things with chemicals ” just leave it as natural as it can be,’ Mr Alkaabi said. Mr Alkaabi, originally from Baghdad, said he was taught to bake in Iraq but developed a deeper love for food, leading him to study chocolate and sugar art in Malaysia and Australia. Mr Alkaabi’s shop, Morris Place Kebabs, was awarded first prize for Turkish bread, after never entering before. The pastry chef said though he had qualifications in management, he enjoyed a hands-on approach to his business.